On March 3rd, interviews for this year’s student ambassadors were held at the home of Fran & Charlene Lemery. 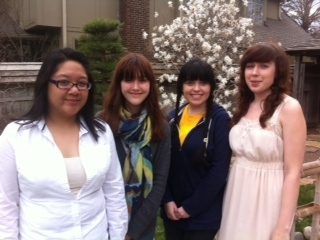 Four local high school students were selected to visit our sister city, Kurashiki, Japan, this July. Congratulations to the students. We’d also like to recognize their teachers. Students were selected based on a variety of factors, including Japanese language ability; ability to answer questions designed to anticipate a successful student ambassador experience; essays; and grade point / letter of recommendation from teachers. A big thank-you goes out to committee chair Lydia Kanki and interviewers Mayumi Wagner and Kotoko Nakata (Japanese interviews) and Dustin Dye and Emily Abouhalkah (English interviews). Four Student Ambassadors were chosen from six strong candidates. We look forward to getting to meet the students and their families, and to hearing about their adventures during our general meeting this September. Congratulations to Bianca Pacis, Katie Conrad, Tiffany Rutschman and Jensyn Ford (pictured left to right).